TORONTO, November 1, 2018 – After a busy summer of construction which saw many significant changes to the site, the property development will continue this fall and winter at Woodbine Racetrack. The land that surrounds Woodbine Racetrack will continue to transform as part of a master plan to create an exhilarating place to live, work, and play in addition to the ultimate destination for horse racing and gaming. After receiving approval to expand gaming in May, construction will begin on new facilities, including a casino operated by Ontario Gaming GTA. To facilitate the large construction project, some accommodations will occur. Grandstand Entrance Road (Ring Road): Grandstand Entrance Rd. is a four-lane road that runs both north and south as well as east and west on the eastern portion of the Woodbine Racetrack property. Grandstand Entrance Rd. is closed in all directions from east of Queen’s Plate Blvd. to just north of the three-way-stop at Stable Road adjacent to Highway 27. Traffic will not be permitted to travel between these two spots. Guests are encouraged to access the Racetrack and Casino from Rexdale Blvd. as there will be no northbound access on Grandstand Entrance Rd. beyond the Stable Rd. intersection. 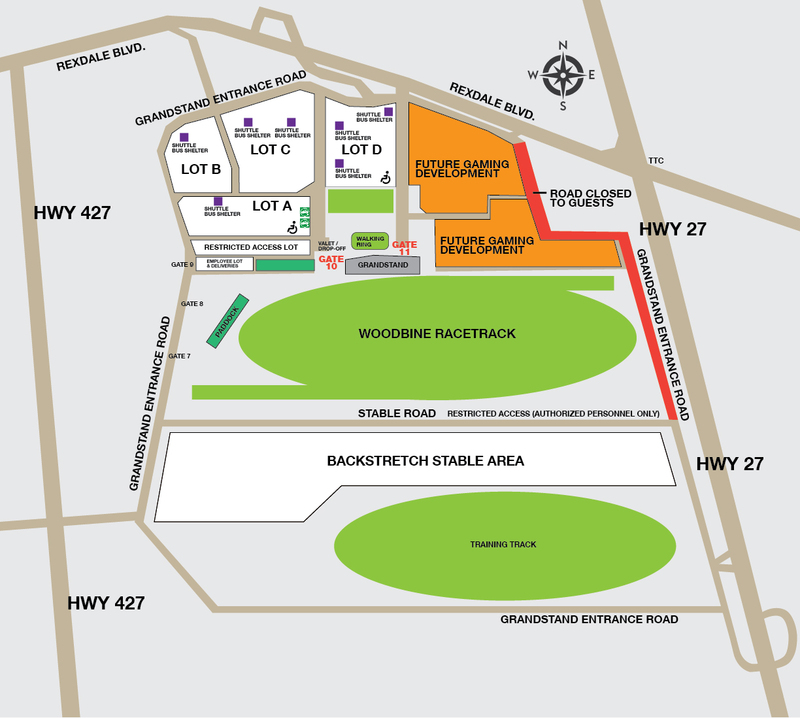 Parking: Parking at Woodbine Racetrack for guests is located on the north-western portion of the property. All guests are encouraged to make use of parking available Lot A, B, C and D as depicted in the accompanying map. Frequent shuttle bus service is available at the locations shown within the map. Queen’s Plate Blvd: Queen’s Plate Blvd. is a four-lane road that runs north and south from Grandstand Entrance Rd. Queen’s Plate Blvd. will have limited access until approximately December 17, 2018. North and southbound traffic will be permitted with lane restrictions. Please expect delays if travelling on this route. To avoid the construction, please utilize alternative north-south roadways on the site such as the road between parking lots D and C.
Valet Parking: A valet parking service was previously located on the eastern portion of the property adjacent to Highway 27. Moving forward, valet parking will be in Lot A, with guest drop-off at the West Entrance at Gate 10. Woodbine Entertainment apologizes for any inconvenience caused by the construction and thanks all of our guests for their patience while the site transforms into the future urban heart of northwest Toronto. This entry was posted in Uncategorised and tagged Ontario Gaming GTA, Parking, shuttle bus, valet parking, Woodbine Racetrack. Bookmark the permalink.